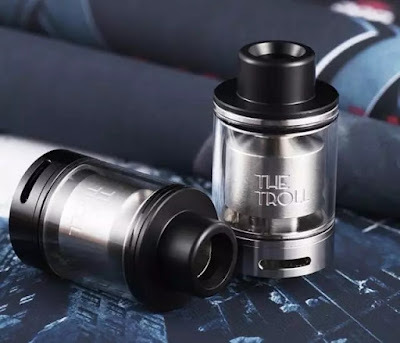 The Roll RTA(rebuildable tank atomizer) is a type of atomizer made by WOTOFO. It is easy to use, no matter you are skilled vaper or beginner at vaping. Users breathe vapor smoothly with The Roll. Airflow enters through the bottom, and then the atomizer, the mouthpiece finally. Homogenization has become a hot word since last year it came to this field. Nowadays, a growing number of vape players begin attaching importance to the dipping structure. And I have to say that the novel dipping design is just the selling point of The Roll. This product is a quality one. Manufacturer is also considerate. To be honest, I would rather rate The Roll as a solution for dripping issue than a new atomizer because this one seems designed to cope with the bugs and it does have a good job on that. I have to say, the outward appearance looks cool. There is no difference with the package. Vendors always pay attention to details. Every accessory is packaged independently. The color of rubber gasket is very special. At present, the black and the stainless steel color sell good in the market. Yet another golden one is also getting popular nowadays. In contrast to MERLIN RTA, The Roll is better. The reason is that its open structure improves the oil capacity so as to hold more oil than the former. Still, compared to VGOD, the Roll also has a good performance in delivering oil because the contact area between cotton and oil is expended in the case of this structure. Apart from those mentioned above, the following are also merits that you can find when using The Roll. First, this product requires cross screw instead of hexagon screw so that you don’t need worry about loosing the Allen wrench. Then, any cotton applied to the Roll does not need a process. Also you can thread cotton straightforward.